Last Wednesday, I wrote about meeting Batman at a summer fest in Schaumburg (IL). Previously, I have written about meeting Batman (Adam West) and other Superheroes. Today, I am featuring one more Batman. Val Kilmer appeared as Batman in the 1995 film version. It was only a few years later when I met Kilmer at the Hollywood Celebrities Show. Kilmer had a huge line and was charging a pretty large amount for an autograph. I wormed my way in for a picture though. I have a special place in my heart for Kilmer from his movie Top Secret! Plus, anytime I can get a photo with a Superhero, I am in! 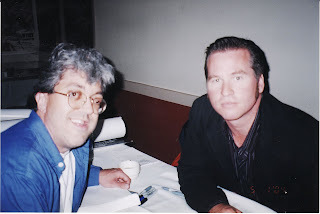 Val Kilmer and me in Rosemont, IL-late 1990's. I think I drove the pacer to River Oaks with you to see Top Secret! Is that when we spun 540 degrees on the icy entrance? Val has a ranch in Pecos New Mexico. I heard he want to run for Governor of New Mexico. ILTG-I never heard that, but it would be interesting. Then I guess I could say I met a Governor. Love, love love Val Kilmer!